I’m a huge fan of Mirror’s Edge, so I can personally vouch for the awesomeness of first-person parkour games, and while we wait for Mirror’s Edge 2, Evan Todd might just be making something better. In math terminology, a lemma is a stepping stone for higher levels of calculation, basically a step to something greater, and the videos and images on the Kickstarter for Lemma, Todd’s first-person parkour game, are all very indicative of that. In other acrobatic platformers, you move from place to place using whatever means available to move quickly and efficiently, but how would the game change if you made your environments with your actions in real time? In Lemma, you wall run, jump, and climb from point A to point B in a voxel environment where every color means something to you as a player. Some block hurt you, some blocks stop the blocks that can hurt you from spreading to other blocks, and some of those blocks implode when you touch them. Some blocks are breakable, some indestructible, and unlike Minecraft, blocks fall, float, and move freely instead of being locked to a grid, but the main focus of Lemma isn’t the blocks. In Lemma every movement you make has the potential to drastically change your situation by changing the environment. 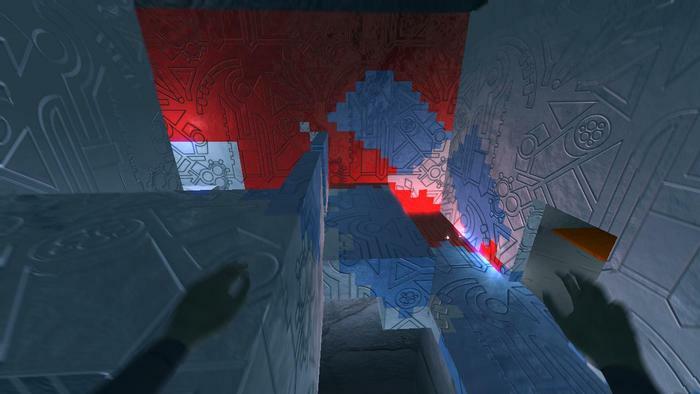 In the demo video on Kickstarter, the character is shown wallrunning on a blue wall as the character makes it in real time with their actions. Lemma is currently seeking funding on Kickstarter, with a game release being possible when the initial goal of $10,000 is reached. Stretch goals include release of Mac, Linux, and SteamOS, and backers can expect t-shirts, stickers, posters, and physical copies of the game. There’s a demo on Lemma’s Kickstarter, too, so go give it a try and see what you think!